Startup founders are known for targeting industries and social institutions in the midst of massive disruption. So it’s not surprising lately to see them launching businesses tied to politics. 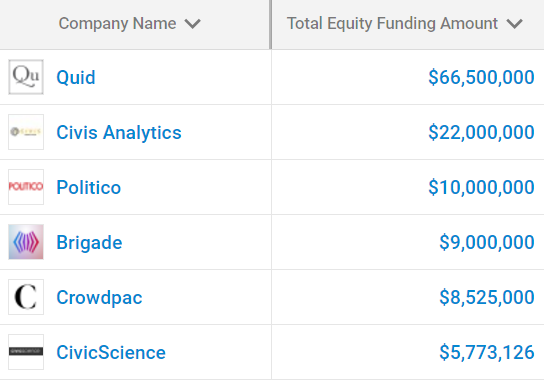 In the last couple of years, venture and seed investors have backed at least twenty companies deploying technology in the political realm, according to Crunchbase data. Funded companies are developing tools to provide higher accuracy alternatives to polling, monitor geopolitical sentiment, and improve civic engagement. Most of the action is at seed and early stage, and by venture standards there’s not a lot of money at play. Investments are typically a few hundred thousand or a few million, although there are a handful that have raised more. The chart below lists some of the larger funding recipients. Crowdpac, a site for crowdfunding political campaigns and causes, has raised $8.5 million from backers including New Enterprise Associates, Index Ventures and LinkedIn founder Reid Hoffman. Civis Analytics, a predictive analytics startup headed by a former Obama campaign big data guru, has raised $22 million from backers including Google’s Eric Schmidt and Drive Capital. Hustle, a developer of apps used by political campaigns to send large numbers of text messages to potential supporters, has raised $3 million from a number of high profile venture firms, including Social Capital. Large venture firms make early stage investments with the expectation that they will be putting more capital to work in later stage rounds. A number of the politically-minded companies that have raised funding pitch their services to multiple industries. Civis, for example, markets its services to big consumer brands and media companies, though it has also worked on Democratic Party campaigns. Quid, a provider of machine learning-powered market research tools, also sells mostly to enterprise customers, though its technology has also been effective in political prognosticating. Others, such as CrowdPac and Brigade, a site promoting social engagement around campaign and policy issues backed by Sean Parker, are more narrowly focused on the political realm. NationBuilder, a startup backed by Andreesen Horowitz that raised its last round in 2013, has also gained a followng for its software that helps automate campaign fundraising and get-out-the-vote efforts. Yet another breed of startup gaining traction uses technology to track and interpret geopolitical trends and events. The most recent funding round in this category, for $3 million, went to Cytora, a UK-based provider of tools to quantity risk based on analysis of world events. In a similar vein, Predata, which deploys algorithms to predict geopolitical volatility, raised just over $3 million in a July round. So far, politically-focused startups have not generated big exits for their backers. Yet there’s reason for optimism about the prospects. For one, the amount of social media interaction devoted to politics has increased sharply in the past year or so. Thus, it’s not hard to envision popular politically-focused startups in the space attracting attention from acquirers. Given the immense valuations of top social media companies (Facebook alone is valued at nearly $400 billion), buyers will also have the ability to pay handsomely. Companies in trendy sectors also tend to do well, and politics fits that description. Americans, in particular, have been spending considerably more time and energy on political pursuits, whether it’s binging on news, debating, reaching out to representatives, or protesting. That’s good news for startups that help make any or all of those of activities easier, faster, or more rewarding.